Do you have stainless steel appliances in your home? They are a beautiful addition to any home, combined with their superior strength and durability. Brand new stainless steel appliances look exquisite until the moment you touch them and notice annoying fingerprints where your hands were. What is the secret to cleaning and preventing this from happening? All stainless steel appliance reveal where you have made your mark, but there are ways to prevent this. 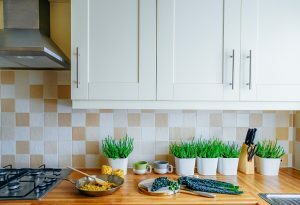 Here are some tips from The Maids, a premier cleaning service in Greensboro, for cleaning and preventing fingerprints on your stainless steel appliances. Brand new stainless steel appliances look fantastic, but within moments, you will notice smudges and fingerprints all over them. The first thing you will want to do is simple: put some white vinegar in a spray bottle and spray a fine sheen all over the stainless steel portion of the appliance. Wipe it off using a soft cloth. Get a new cloth (soft) and grab a bottle of mineral oil. Look at the appliance closely and try to determine which way the grain runs, then pour some mineral oil onto the rag and wipe it on the appliance, going with the grain. If you do not have mineral oil, another option would be olive oil or baby oil. Just follow the same pattern, going with the grain as previously described. Finally, grab one more soft cloth and buff everywhere you just wiped with the oil. Some of the oil will come off, but not all of it. Buff really well to be certain the top is not tacky, which would attract dirt. 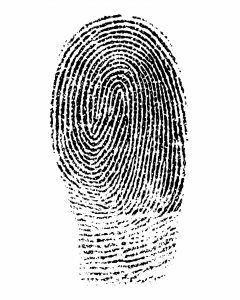 If you do this once a week, you will see a tremendous decrease in fingerprints and smudges. Another option would be to consider purchasing black or slate stainless steel appliances. If these darker colors fit your décor, fingerprints and smudges are less noticeable on them. Fingerprints on your appliances may be the least of your worries in your kitchen. Tending to your home and keeping everything clean and in order takes a lot of time and effort. Save yourself the time and trouble by hiring an experienced cleaning service in Greensboro: The Maids. By offering a wide range of services and flexible scheduling, The Maids can accommodate you whether you need daily, weekly, or monthly service, or if you just need a one-time deep cleaning for a special event. Call (336) 292-7805. Do your kids struggle with managing their messes? Kids aren’t born with a natural ability to be organized. They lack the skills and more importantly, the motivation. Toys fall where they may and are forgotten as new ideas lead a child to the next plaything. Clothes are often shed and left all over the floor, the bed, and other surfaces. Then when parents get tired of the mess and demand that the kids clean up, they often don’t know where to start or how to properly sort through the vast number of objects littering the floor. A few basic tips can help kids to clean up and keep their things more organized. After you get the kids organized, if you still need help with home cleaning in Greensboro, call The Maids to help you declutter. Color Coding. 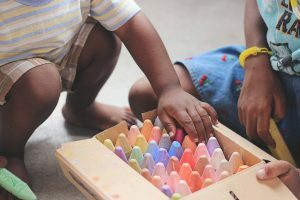 A color system for organizing works for even the youngest children. Get bins of a certain color or label bins with colored tape or labels. Then assign all items a certain color bin to live in. It may help to put a piece of colored tape or a marker spot somewhere on each item so that it’s easy to determine which storage bin it belongs in. Simply match the colors and cleanup is a cinch. Dual-Purpose Storage. Get organized and save space at the same time by creating strategic storage areas that serve two purposes. Like benches or ottomans with storage under the seats. Make the most of the space under the bed with rolling storage bins that pull out and roll back under easily. Turn an old coffee table into a play table and use the storage space underneath for Legos or other toys. Daily Clothing Bins. Tired of the clothing mess? You’re not sure what’s clean and what’s dirty. Your child wants to choose what to wear but you don’t approve. It’s enough to drive you crazy and make you late. Get a set of bins and plan outfits for the whole week. Put the entire outfit for each day in the bin including socks, underwear, and even shoes. Label the bins with the days of the week. Character-Code Bathrooms. Does everyone seem to get their towels, washcloths, facecloths, etc. mixed up? Assign everyone a character, like a superhero or Disney princess and get all items that match their character. Label each spot where items belong with the proper character and see how easy it is to keep the bathroom organized. Entryway Organizer. Another one of the most disorganized places in homes with kids is the entryway. Everyone comes in and sheds their jackets, shoes, backpacks, keys, etc. and it can create quite a mess. An entryway organizer is designed specifically to organize this area. There are many options available from a metal rack with a series of hooks and a shelf for shoes to a wooden structure with separate cubbies for each child’s personal items. Getting organized is an important step in improving the look and feel of your home. Kids thrive in orderly environments and adults do too. Organize the clutter and then schedule professional home cleaning in Greensboro to give your home a deep clean. Get on a routine cleaning schedule that will help your family to keep things neat and organized. Call The Maids of the Triad: (336) 292-7805. Do you love your pets but not necessarily their smells? Or maybe you don’t love pets but the previous owners of your new home or apartment did, and they left the smell behind. Perhaps you need to get the pet smells out of your home before you put it on the market. 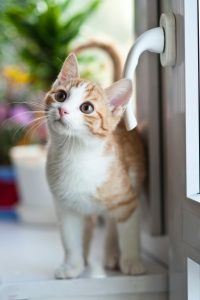 Whatever the reason, you probably don’t want guests to be greeted with the smell of pets as soon as they walk in your front door. Take heart; it is possible to remove pet odors from your home, even if pets are currently residing there. Here are some tips for removing those pesky smells and preventing them in the future. And for a little extra help, hire a maid service in Greensboro like The Maids of the Triad. Start at the Source of the Smell. If your home smells of pets, it’s often because there is a mess somewhere that needs to be cleaned up. Do your best to thoroughly and completely clean up pet accidents as soon as you discover them. This will go a long way toward eliminating the odors in your home. Clean the litter box and replace with fresh litter. Wash the dog’s bedding and clean all of your pets’ favorite spots. Use enzyme cleaners that will break down the proteins in bodily fluids. Use powdered cleaner to vacuum carpets. Use a carpet shampooer or have your carpets professionally cleaned. Remove odors from upholstery using water, dish soap, and a soft brush. But be sure to read the care instructions first, as some upholstery is dry clean only. To clean leather, mix water and vinegar and use a soft cloth to wipe down. Be sure to wring as much water as possible out of the cloth before wiping. Open windows as much as possible and let a fresh breeze blow through. Use an air and fabric freshener spray. Hire a maid service in Greensboro to give your home a thorough, professional-grade cleaning. Clean the litter box often. Clean up accidents as soon as you discover them. Wash bedding and materials where pets lay. Vacuum frequently and shampoo carpets periodically. Schedule a maid service in Greensboro to clean your home regularly. Sometimes you’ve done all you can and those pesky odors still keep hanging on. It’s time to call in reinforcements: The Maids of the Triad. The Maids specialize in cleaning homes so that your guests won’t know you have pets unless they see them. And all cleaning products used by The Maids are pet-friendly, so you will know your home is clean and your pets are safe. To schedule a deep clean of your home, call (336) 292-7805. Do you enjoy cooking and creating all sorts of culinary masterpieces? Or maybe you simply microwaved some fish sticks for the kids last night. Either way, cooking smells can sometimes linger for what seems like forever. Whether you’re expecting guests, showing your house, or just want a fresher smelling home, there are ways to banish those lingering cooking smells. Try these tips on your own and if you’re still not satisfied, hire one of the most reliable cleaning services in Greensboro to give your home a deep clean that will leave it smelling fresh: The Maids. It’s much easier to remove cooking smells if they aren’t as strong to begin with. Proper ventilation is the key to controlling cooking odors. Be sure to run ventilation fan over your stove while you are using the stovetop or oven. Open doors and windows while cooking, if the weather permits. All of these things help keep the smells from taking root in the house. Push out those stale cooking smells by cooking something more pleasing. Try boiling a pot of water on the stove with lemon or orange peels. Boiling cloves works as well. Bake just a little bit of butter, cinnamon, and brown sugar in the oven. Place baking soda in bowls around your kitchen. Soak cotton balls with vanilla and place them around your kitchen. Make a pot of coffee or just roast the beans to get the same aroma. Candle warmers are popular and often make beautiful decorations, but they are not as effective at eliminating smells. While warming scented wax does allow the fragrance to permeate, the act of burning a candle with a flame goes much further toward dissipating odors. Warming the wax just adds the smell to your home and may mask the cooking odors a little, but it’s not as effective as burning will. You can purchase air purifiers that stand alone in a corner and help to freshen the air in your home. The air gets pulled in through a HEPA (high-efficiency particulate arrestance) filter and the particles in the air that cause the odor are removed. You can also have an air purification system installed in your HVAC (heating, ventilation, and air conditioning) system. These filter the air as it enters your heating and cooling system ducts to remove particles and odors. Some systems even create new fresh air molecules that are distributed throughout your home. To really banish those stubborn cooking smells, hire the best cleaning services in Greensboro to give your home a deep clean. The Maids of the Triad can clean your kitchen, the source of the smells, and the other rooms in your home that are less affected. Every corner, every surface, everywhere. Call (336) 292-7805 for a free estimate. We all want a clean, healthy home. But that is often easier said than done. No matter how thoroughly you clean, bacteria find ways to take hold. Once you know where to look, it’s easier to combat these bacteria breeding grounds. Want to be sure these areas are cleaned regularly? Schedule professional home cleaning in Greensboro on a regular basis. Refrigerator. You keep food in the fridge so that it won’t spoil; you wouldn’t expect bacteria grow there. However, it is actually one of the most common places for bacteria to thrive. When foods get spilled, especially milk and raw meat, the bacteria have something to live on and they easily populate in the cool, dark environment. And we’re talking about serious bacteria like salmonella and E. coli that can make you sick enough to land you in the hospital. Disinfect your fridge by wiping down shelves and drawers with cleaning wipes that kill bacteria. Entryway. Wherever you and your family typically enter your home probably has the highest bacteria concentration. How does it get there? On your shoes. Everywhere you walk during the day like public restrooms, restaurants, the office, the grocery store, school, the playground, etc. all of that comes in on your shoes. Removing shoes at the door is one of the best things you can do to stop the spread of bacteria through your home. Disinfect the floor in your entryway often. Bathroom. This one is probably not a surprise to you, but what may surprise you is where in the bathroom you’ll find the highest concentration of bacteria. Brace yourself for this one: your toothbrush holder. A disturbing realization isn’t it? Everyone brushes their teeth and puts their toothbrush in the same holder on the bathroom counter. 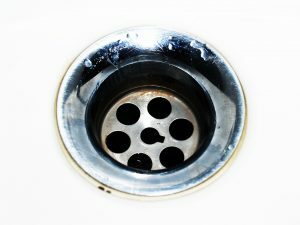 The water and bacteria on toothbrushes drip down inside the reservoir at the bottom and germs thrive. Then you brush with that same toothbrush the next day or later that same day. Disinfect this area often and avoid the potential for illness. Laundry Room. You expect that with detergent swirling around in your washing machine and the fresh smell of dryer sheets that your laundry room is bacteria-free. Unfortunately, that may not be the case. Bacteria can build up in your washing machine and even in your laundry baskets themselves. Think about it: you throw dirty, sweaty, bacteria-covered clothes into your laundry basket. You carry the laundry basket to the laundry room, load the clothes into the washer, then the dyer, then back into the same dirty basket. Eliminate bacteria by wiping down your laundry baskets between loads of laundry with a soapy washcloth. Once or twice a month run washing machine cleaner through a regular cycle to kill bacteria in your washer. The best way to eliminate bacteria from your home is to leave it to the professionals. The Maids 22-Step Deep Cleaning System makes sure every area of your home is cleaned and disinfected. Call today to schedule home cleaning in Greensboro: (336) 292-7805. If you or anyone else in your home enjoy red wine, you’ve surely experienced a spill at some point. 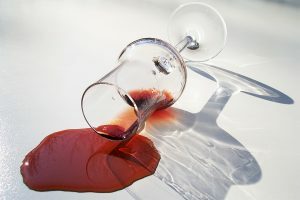 Whether it’s on clothing, a tablecloth, upholstery, or carpet, wine stains are stubborn and hard to remove. But it may be possible with these tips. And if not, professional cleaning companies in Greensboro such as The Maids can often get out tough stains when all else fails. When you can throw it in the washing machine, the stain removal process is much easier. The key is in the pre-treatment. As soon as possible, dab the stain with a damp cloth while still wet to absorb the wine. Don’t rub, or the stain may spread. Stretch the material across an open surface like a bowl and pull taut. Secure with a rubber band. Apply salt to cover the stain. It will absorb the wine in about 5 minutes. Boil water and carefully pour it over the stain. Wash in your washing machine on the hot water setting. If the stain didn’t come out, don’t put it in the dryer. Drying will set the remaining stain. These steps work on any machine-washable material from clothing to cloth napkins to tablecloths. Do not use on dry-clean only fabric. Use a dry cloth to soak up as much of the wine as possible, as soon as possible. Remember to dab, don’t rub. Pour a little cold water directly on the stain, then dab the stain some more. Mix 3 parts water to 1 part baking soda and apply it to the stain. Allow to dry, then vacuum. Blot stain to soak up the wine. Mix 2 cups of warm water with one tablespoon of vinegar and one tablespoon of dish soap. Apply to stain with a sponge. Blot until the stain is gone. Use a clean cloth to soak up the wine. Mix 2 cups of cold water and one tablespoon of dish soap. Apply to the stain with a clean cloth. Dab until removed and absorbed. Clean with clear water to remove the soap solution. Professional house cleaners are experts at removing stains from all kinds of areas in your home. If you’ve tried everything and the wine stain is still hanging on, call The Maids. Your cleaning team will pull out all the stops to remove that stubborn wine stain from your carpet or upholstery. Other stubborn upholstery stains may be removed as well as the wine stain, giving your furniture a fresh look. If you’re looking for cleaning companies in Greensboro that can handle tough stains, call The Maids: (336) 292-7805. Are you particular about how your dishwasher is loaded? Most of us have a certain way we think it should be done, and can often be found rearranging things after someone else has done the loading. 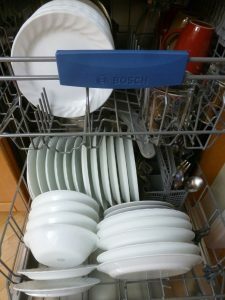 The key is to strike a good balance between getting the most dishes in the racks as possible and arranging them in a way that will still get them clean. 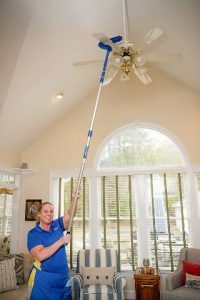 Here are some tips from an expert maid cleaning service in Winston-Salem, NC. Rinse First – You will always get better results if you rinse the food off of dishes before putting them in the dishwasher. It also keeps your dishwasher from clogging up with food particles. If you’re planning to run the dishwasher right away, just rinse enough to remove uneaten food. If you may not run the dishwasher until later or the next day, a more thorough rinse may be in order. Angle Dishes Toward the Spray – Most dishwashers spray water from the center, so the plates and bowls should face the center for best results. Load Small to Large from the Center Out – Put the smallest things closer to the center and the larger items like pans, trays, and platters along the outside. If you put large items in the center they will block the spray of water from reaching the smaller dishes on the outside. Plastic Items Should Go on the Top Rack – The heating element in typical dishwashers is at the bottom, so plastic should be loaded on the top rack to keep from melting. Be sure all plastic is secure and not small enough to fall through onto the heating element. Load Cups at an Angle Between Prongs – Cups should go between prongs, not on them as the prong can leave water marks in your glasses. And to prevent water pooling on the cup bottoms, load them at an angle as much as possible to encourage the water to run off for faster drying. Separate Fragile Items – Delicate things like wine glasses and crystal need plenty of space between to keep from hitting together and breaking. Try loading plastic items between them to save space. Keep your Flatware Separated – Newer dishwashers have a silverware basket with slots to help keep your spoons and forks from nesting together and not getting clean. But if you have the old fashioned basket, each compartment should have a mix of different utensils. Turn some up and others down for more variety. Sharp knives should be separate from other flatware to prevent scratches or nicks. If you have actual silver or silver-plated flatware, keep it separate from any stainless steel, which can cause a bad reaction in the heat and moisture. Want help from a professional maid cleaning service in Winston-Salem, NC? Whether its dishwasher loading or other housekeeping issues that are bogging you down, The Maids of the Triad can help. A reputable maid cleaning service in Winston-Salem, NC, The Maids can take the hassle of housecleaning off your hands and make your home sparkle. Cleaning regimens are designed to work around your busy schedule so you can simply come home to a clean, fresh-smelling house. Call The Maids to get started today at (336) 292-7800.